NCSA Mosaic was neither the first web browser (first was the WorldWideWeb of Berners-Lee) nor the first graphical web browser (it was preceded by the lesser-known Erwise and ViolaWWW), but it was the web browser credited with popularizing the World Wide Web. Its clean, easily understood user interface, reliability, Windows port and simple installation all contributed to making it the application that opened up the Web to the general public. There were several web browsers available then, but they were for Unix machines which were rather expensive. This meant that the Web was mostly used by academics and engineers who had access to such machines. The user-interfaces of all available browsers also tended to be not very user-friendly, which also hindered the spread of the WWW. That's why Marc decided to develop a browser that was easier to use and more graphically rich. 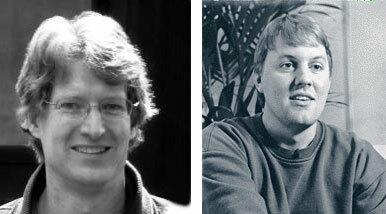 In the same 1992, Andreesen recruited his colleague from NCSA and University of Illinois, Eric Bina (Master in Computer Science from the University of Illinois from 1988), to help with his project. The two worked tirelessly. Bina remembers that they would work three to four days straight, then crash for about a day. They called their new browser Mosaic. It was much more sophisticated graphically than other browsers of the time. Like other browsers it was designed to display HTML documents, but new formatting tags like center were included. The most important feature was the inclusion of the image tag which allowed to include images on web pages. Earlier browsers allowed the viewing of pictures, but only as separate files. NCSA Mosaic made it possible for images and text to appear on the same page. It also featured a graphical interface with clickable buttons that let users navigate easily and controls that let users scroll through text with ease. Another innovative feature was the new form of hyperlink. In earlier browsers hypertext links had reference numbers that the user typed in to navigate to the linked document. The new hyperlinks allowed the user to simply click on a link to retrieve a document. NCSA Mosaic was also a client for earlier protocols such as FTP, NNTP, and gopher. In January 1993, Mosaic was posted for free download on NCSA's servers and became immediately popular, more than 5000 copies were being downloaded each month. Within weeks tens of thousands of people had downloaded the program. The original version was for Unix, but Andreesen and Bina quickly put together a team to develop PC and Mac versions, which were released in the late spring of the same year. With Mosaic now available for more popular platforms, its popularity soon skyrocketed. More users meant a bigger Web audience. The bigger audiences spurred the creation of new content, which in turn further increased the audience on the Web and so on. As the number of users on the Web increased, the browser of choice was Mosaic so its distribution increased accordingly. By December 1993, Mosaic's growth was so great that it made the front page of the New York Times business section. The article concluded that Mosaic was perhaps "an application program so different and so obviously useful that it can create a new industry from scratch". NCSA administrators were quoted in the article, but there was no mention of either Andreesen or Bina. Marc realized that when he was through with his studies NCSA would take over Mosaic for themselves. So when he graduated in December 1993, he left and moved to Silicon Valley in California. NCSA Mosaic won multiple technology awards, including being named 1993 Product of the Year by InfoWorld magazine and 1994 Technology of the Year by Industry Week magazine. 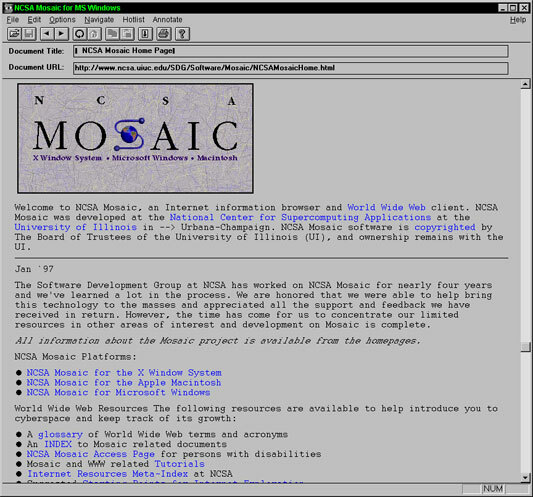 NCSA discontinued support for Mosaic in 1997, shifting its focus to other research and development projects, but Mosaic browser is still available for download along with documentation at NCSA FTP site—ftp://ftp.ncsa.uiuc.edu/Mosaic/.